Are they trying to get this on Spotify? Seems kinda weird not to have it available for streaming there or even bandcamp. How great is this? I talked to David Zollo just before Middle Western's set last week, told him I wanted to hear some High and Lonesome, but its hard to find. He's burning and mailing me their discography! Sounds like a really cool guy and glad to see he's hooking you up. I know! That's why I put the album on YouTube, with their OK, pending some other streaming availability. Not sure who's handling album sales, distribution, or plans for streaming. 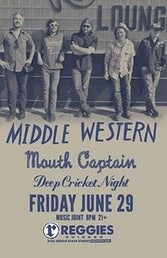 Middle Western is in Chicago on Friday! I'll join in on the Middle Western love. I've been watching Zollo and Whitmore play in bars since I was old enough to be in bars! Very nice guys too. I got a couple of signed vinyl (signed by full band) for me and a buddy...that's one I'll treasure. I was bummed when the vinyl sold out right away. Also re-visiting Whitmore's back catalog. I'm really only familiar with his first album, which i have on CD. I have a later album on vinyl but it hasn't gotten much play, time to dig it out!